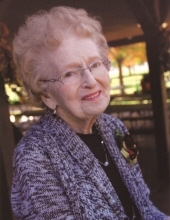 Mary Grace O'Brien, age 97 of Le Sueur and St. Thomas, died on Friday, November 2, 2018 at the Minnesota Valley Health Center in Le Sueur. Mass of Christian Burial will be on Thursday, November 8, 2018 at 10:30 a.m. at St. Anne's Catholic Church. Visitation will be on Wednesday, November 7, at the Kolden Funeral Home in Le Sueur beginning with a 4:00 p.m. C.C.W. Rosary and concluding with a 8:00 p.m. Vigil Service. Visitation will continue on Thursday morning at the funeral home from 8:00 a.m. until 10:15 a.m. Following the Mass, burial will take place immediately at St. Thomas Catholic Cemetery in St. Thomas. A lunch will be served at St. Anne's School following Mass and also following the burial services. Mary Grace was born on October 2, 1921 to Timothy and Alice (Halloran) Burns in St. Thomas, MN. She attended Country School near St. Thomas and graduated from Le Sueur High School in 1938. She taught in country school, (1st - 8th grade) after attending Normal School and before she married Francis O'Brien on July 17, 1945 at St. Thomas Catholic Church in St. Thomas. Mary Grace and Francis lived on a farm and raised their family near her childhood farm. Education was very important to Mary Grace. She later attended and received her Bachelor's Degree from Mankato State College. She was a long time member of the St. Anne's C.C.W, and St. Thomas & St. Anne's choirs. She was a life time member of the Le Sueur Historical Society, along with teaching in 4-H and many bible study groups. She wrote the St. Thomas News for the Belle Plaine newspaper for over 50 years, a job she inherited from her mother who had started writing it in 1906. She enjoyed her time with family and friends, whether it be playing card games, knitting, sewing, canning, baking, or doing crafts. She is survived by her children, Annette (Edward) Rasmussen of Le Sueur, Arlene (Pat) O'Brien-Finn of Eden Prairie, MN, Mary Devine of Le Sueur, Mike (Sue) O'Brien of Le Sueur, Joseph (Becky) O'Brien of Enon, OH, Ron O'Brien and Stephanie Boone of Hastings, MN; brother, Edward (Eileen) Burns of Lake Havasu City, AZ; sister-in-law, Rosemary Burns of Le Sueur; 12 grandchildren, Stephanie McElroy, Jennifer (Matt) Johnson, Brad (Sheryl) Boren, Josh (Heather) Kinkeade, John (Sarah) Kinkeade, Jessica (Horacio) O'Brien-Ferres, Matthew O'Brien-Devine, Angela Devine-Wilmes, Sarah (Nick) Shouts, John Devine, Angela Green, and Nick (Becki) O'Brien; 22 great-grandchildren; and 1 great-great-grandchild. She is preceded in death by her parents; siblings, Madelyne Wolff, Mildred Graham, Alice Hoehn, Kathleen Fogarty, Jack Burns, and Timothy Burns; and former husband, Francis O'Brien.